O.CT Tuning gives the Audi R8 a new tuning package. Overall performance gets upgraded from the standard output of 414hp to a 557hp. It seems like there&apos;s a never-ending list of German tuners. This time, O.CT Tuning is introducing a new kit for the Audi R8 dubbed the Black Compressor. 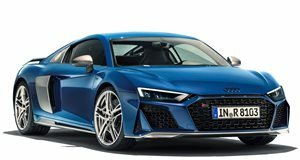 The new package includes a compressor kit with an ECU optimization and a new stainless-steel exhaust system which gives the standard R8 an R8 GT-like boost. Under the hood, power increases on the 4.2-liter V8 from the standard 414hp to 557hp and 413 lb-ft of torque. The new performance kit allows the R8 to go 0.7 seconds faster from 0 to 60 mph over the standard version. In addition, the tuner lifted the V-max limited on the car so it can reach 155 mph in just 24 seconds. Along with pricing, no other details were given, specifically whether or not the interior received any upgrades.